President Michel Aoun met on Monday with head of the Arab League Ahmad Abul Gheit at the Baabda Presidential Palace. He also said that the results of the Arab summit were discussed during the meeting. Stressing that Aoun is keen on following up on the summit’s decisions. 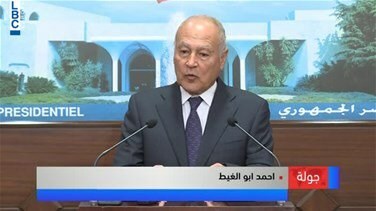 As for the return of Syria to the Arab League, Abul Gheit said that such an issue is related to the political agreement. “I did not feel yet that there are conclusions that lead to agreement over Syria’s return to the League,” he added. This as Abul Gheit met with Prime Minister Saad Hariri whereby talks focused on the latest developments in Lebanon and the region. He also phone called Lebanese Forces leader Samir Geagea and Progressive Socialist Party leader Walid Jumblatt.